As a Non-Profit charitable organization, this is one advantage method we take in raising funds for ongoing operations and program(s) support. 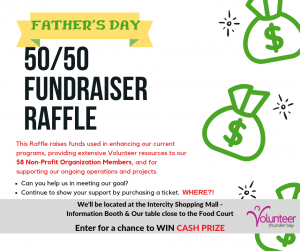 This Raffle Fundraiser bestows funding used in enhancing our current programs, providing extensive Volunteer resources to our 58 Non-Profit Organization Members, and for supporting our ongoing operations and current projects. Can you help us in meeting our goal? Drop by the Intercity Shopping Mall & purchase your TICKETS today! IT WAS A MAJOR HIT & SUCCESS! 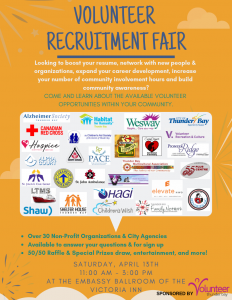 This year’s Volunteer Recruitment Fair was held on Saturday, April 13th 2019 at the Victoria Inn Ballroom. Non-Profit and Charitable Organizations set up to explain how volunteers are important to the success of their operations. All of these organizations and agencies are members of Volunteer Thunder Bay’s community network. It always is an excellent opportunity for you to learn all about the many different volunteer positions available in our community! Whether you are looking to learn new skills, share your knowledge, increase your community involvement hours or take a break from the stresses of school or work there are volunteering options for everyone. Next year will be bigger, better and brighter!